We roared with laughter but Uncle Upali wasn’t far wrong. These bite sized morsels of delicately fried fish cakes have never failed to please. It’s not even that. I’ve never seen anyone eat just one. Risking peaking too early in the progression of a Sri Lankan feast (who am I kidding? Everyone peaks too early in a Sri Lankan feast – the savoury-spicy hits force you into a sprint before you realise too late that in fact it was a marathon), guests will daintily take the first two fish cutlets when offered, pretending to refuse more. The third, fourth and sometimes even fifth fish cutlet is usually surreptitiously scoffed down when it is safe to assume that no-one is looking (except everyone is of course, because they also want another one … or perhaps two). It seems to me such a waste to wait for an invitation to a special event to eat fish cutlets. So, it's lucky that I’m always searching for a contemporary perspective on things – you know, I want to have my cake (or should I say, cutlet?) and eat it too. The light bulb turned on when I stumbled upon the wonderfully named Colombo No. 7 gin a few months ago. I struck upon the idea of ditching the dinner party altogether (goodness knows, dinner parties went out with dial-up telephones anyway) and instead creating an afternoon soiree where fish cutlets are accompanied Colombo No. 7 gin martinis. It’s what I’m going to call a "Sri Lankan sundowner". The Gin Foundry’s article also gives you the back story on all the things relating to Colombo No. 7 gin – that it’s based on a 70 year old recipe conceived and distilled in Sri Lanka during World War 2, the original recipe used Tanqueray gin as inspiration but added its own Lankan flavours in the form of cinnamon, ginger and curry leaves and, to avoid a precarious political climate on alcohol policy in Sri Lanka immediately post-civil war, that distillation of Colombo No. 7 gin was moved to the UK. A fascinating read. But I digress. My idea of a Sri Lankan sundowner reminds me of one of my uncles who used to go to the Sinhalese Sports Club of an afternoon for a beer and "a bite”, usually devilled chicken or cuttlefish. It is really my tribute to that lingering memory. So my Sri Lankan sundowner has a very simple formula. All you need is a few friends over on a lazy afternoon, enough ingredients (Colombo No. 7 gin, dry vermouth and a few twists of lemon or lime zest) for as many dry martinis as your friends can imbibe and a large quantity of freshly fried fish cutlets - see recipe below. It's a winner! This is one of my mother's best kept secret recipes. And the magic ingredient? A good quantity of freshly cracked peppercorns. Trust me. It makes a difference. Cook cut potatoes in salted boiling water until cooked through. Drain and roughly mash (you will need some small pea-sized chunks of potato to remain for the fish cutlets' final overall texture). Leave aside to cool. In a medium sized frypan, dry fry the onions, curry leaves and chillies over a medium heat until the onions are a little dehydrated (they will visibly shrink in size). Add 2 tablespoons of vegetable oil to the lightly dehydrated mixture and continue to shallow fry it until the onion is transparent. Add the drained tuna and break it up into pieces with your wooden spoon whilst continuing to fry the ingredients in the frypan for approx. 5 minutes. Your mixture should have a relatively smooth consistency by this stage. Add salt and cracked peppercorns and continue to mix and fry for another minute. Add the lemon juice and continue frying until the excess moisture in the frypan has evaporated. Take the mixture off the stove and place it into a large bowl and allow to cool a little. Add the cooled, mashed potatoes to the tuna mixture and mix together (and don't be tempted to continue to mash the mash at this stage!). Using your hands and a tablespoon for guidance, form large walnut-sized balls* with the final mixture. 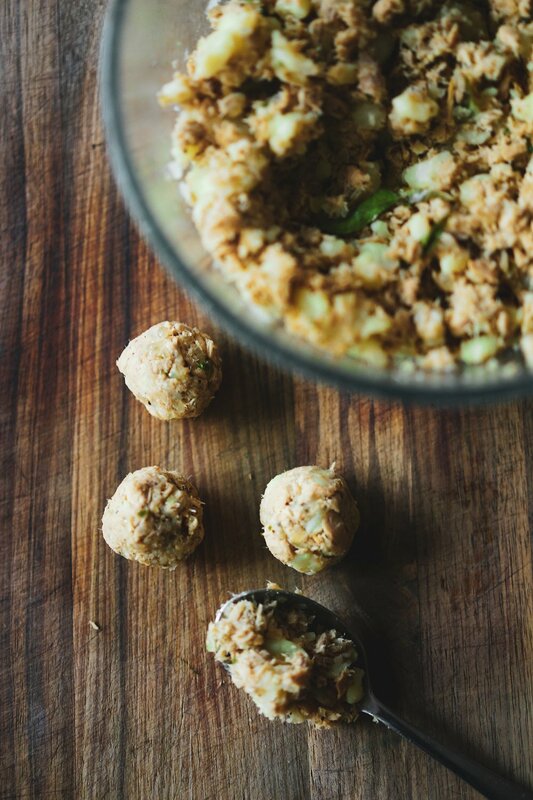 Place the lightly beaten egg in a small bowl and place the breadcrumbs in another small bowl. Coat the balls in the egg wash and then the breadcrumbs. Shape the balls into a round using the palms of your hands. At this stage, fish cutlets which aren’t being immediately used /fried can be refrigerated for up to a week. Heat sufficient vegetable oil in a medium sized saucepan and deep fry the fish cutlets in small batches**. Fry until golden brown. 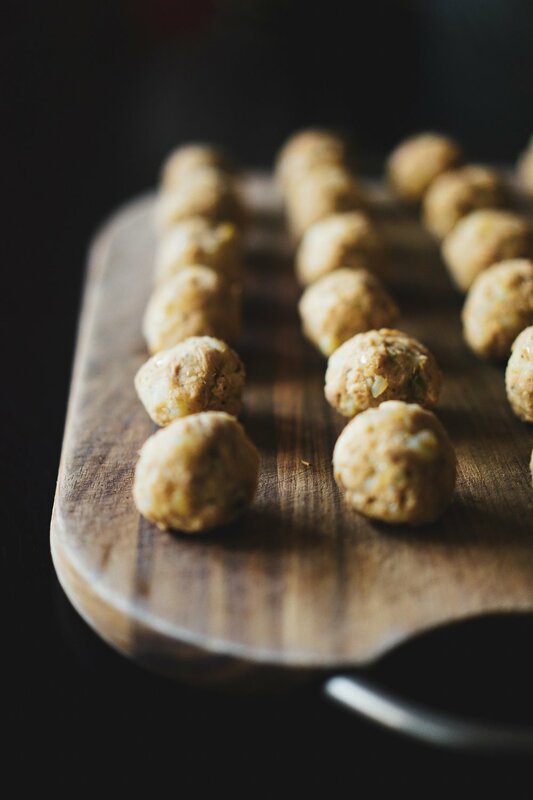 * To assist with uniform cooking times as well as presentation, aim to get these balls around the same size. Don't worry too much about perfecting the round shape - that can be easily done once the egg wash and breadcrumbs have been applied. ** To determine whether the oil is sufficient hot, drop a small reserved piece of fish cutlet filling into it. If that floats to the top and turns golden almost immediately then it's ready. Also, don't overcrowd the saucepan with fish cutlets in the deep frying process. *** Dipping sauces are traditionally not used or needed for fish cutlets but that doesn't mean you couldn't or shouldn't. A fiery chilli sauce is always my go-to sauce but the hot pink mayonnaise created by What Katie Ate for her crab cakes recipe is also brilliant.